We had better start answering Darcy’s question by saying what epigenetics is. What, if anything, is epigenetics? So far, this blog has focused on discussing how and why we are trying to determining the sequence of the tuatara genome. Of course, there is much more to an organism that its DNA. Indeed, every cell in a tuatara has the same genome* but those cells come in many different forms, and combine in various ways to produce the different organs that keep the tuatara’s day-to-day biology ticking over. Clearly, DNA alone can’t tell us how those differences arise. The term “epigenetics” is a slippery one. 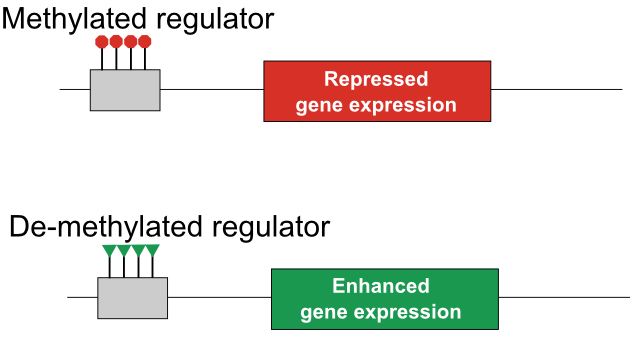 In its modern sense it refers to the control of the gene expression, but depending on who is talking it can refer to different subsets of the processes illustrated above. Increasingly, the term is used to describe any process that alters the way a gene is expressed. Most scientists still prefer definitions that are more restrictive. Some save the word for processes that chemically alter DNA and the proteins that pack DNA into chromosomes. Others limit it to those changes in gene expression that can be passed on through cell division or even from parent to offspring. The last definition, restricting epigenetic effects to those that can be inherited from one cell division to the next, is the most popular one in the scientific literature. Such changes can be brought about by almost any of the processes illustrated above. Proteins and RNAs that control the expression of a gene can set up feedback loops that survive into daughter cells after cell-division. Similarly, some changes in the way in which DNA is packaged into chromosomes can also maintained. 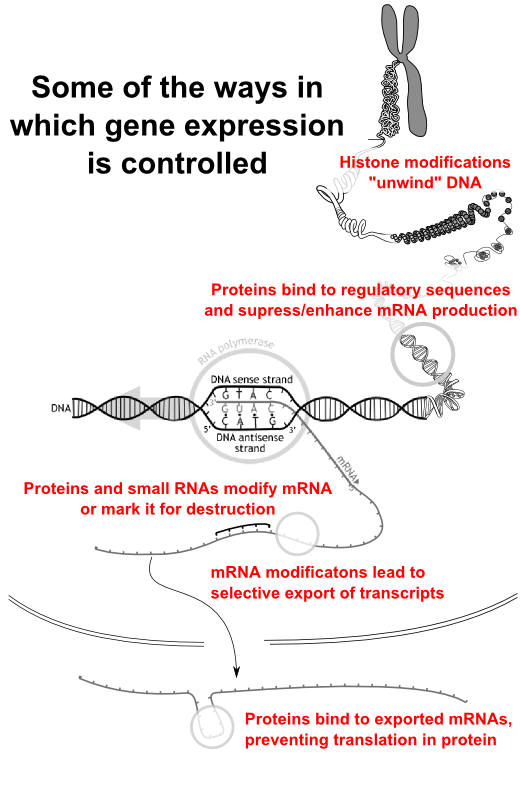 The most widely talked about epigenetic process, however, is DNA methylation. In this case, a small molecular “tag” is added to DNA bases in regulatory regions of a gene, resulting in the down regulation of that gene. That picture make DNA methylation look simple, but it’s important to remember these tags only one part of the complex way in which gene expression is controlled. The presence of DNA methylation is itself altered and maintained by proteins, which are derived from genes, the expression of which are in turn controlled by all of the mechanisms depicted above. Why is there a buzz around epigenetics ? Epigenetics is a popular topic in biology these days. Hardly a week passes without someone making a bold claim for the power of epigenetic research to explain disease, change our understanding of evolution or finally tell us whether nature or nurture provide the most important input to our development. Some articles on epigenetics would even lead you to believe that scientists have only recently considered the control of gene expression an important topic, or that the concept of an environmental input to the process is a new idea. Of course, that’s not true. Quantitative geneticists had already developed methods to handle the interaction of genes and environmental influences in the 1920s, long before they knew what a gene was made of. Similarly, the control of gene expression was a hot topic in molecular biology in the 1960s, and has been continuously studied since that time. There is something new, and genuinely exciting, about modern epigenetic research. It is now abundantly clear the DNA methylation is an important player in the control of gene expression in some organisms, including mammals like us. The gene expression changes brought about by changes in DNA methylation are also relatively stable, so they can help to explain long-term changes in the way organisms use their genes. Just as importantly, modern sequencing technologies make it easy to measure the presence or absence of methylation on DNA bases across whole genomes. That means biologists can directly measure difference in methylation between individuals, between different tissues in the same individual, or between healthy and cancerous cells in the same tissue. Epigenetic research has shown that cancerous cells often have apparent patterns of DNA methylation, including tags that silence the genes usually responsible for overseeing the repair of DNA. It’s also shown us how honey bees can switch careers in the middle of their lives and how some plants can direct their development to match with the environment that find themselves in. It remains to be seen if epigenetics lives up the hype that surrounds the topic, but, to finally answer Darcy’s question, there is no doubt that epigenetics is important. So, what are we doing about epigenetics? Darcy wanted to know how important epigenetic markers would in recording “all the genomic information” for tuatara. If the goal of a genome project was to completely explain the molecular basis of an organism’s biology, then epigenetic data would be extremely important. The control of gene expression is the key mechanism by which organisms direct their development, and one means by which all organisms react to their environment. Epigenetics, however defined, is an important contributor to gene expression and DNA methylation is one part of that puzzle that can be directly measured. So, if a genome project was about trying to completely explain an organism’s biology then recording epigenetic data would be very important. But no study, and certainly no a genome study, can answer every question about an animal. Indeed, one of the main goals of the project is to provide a resource that will help scientists ask and answer new questions about tuatara for decades to come. We will not directly measure any eipigenetic markers**, but the draft sequence we are producing will allow other researchers to do so at a whole-genome scale. Even better, we will work to annotate the draft genome with information on the function of the different genes we sequences. Thus, anyone performing epigenetic studies on Tuatara will be able to connect their results to the biological function of the genes that relate to. If our brief description of epigenetics has left you wanting more details, be sure to check out Grant Jacobs post on the same topic (and answering the same question). Grant is going to feature a series of posts on the same topic, so stay tuned for more. *It’s hard to find hard and fast laws in biology, and even this isn’t quite true. Mutations accrue over the course of an organisms’s life, making the DNA in some cells different from others. Some organisms also go out of their way to alter the structure of the genome in some cells, particularly in order to create variation that might help fight diseases.